Location: Twin Waters, Sunshine Coast, QLD. Australia. 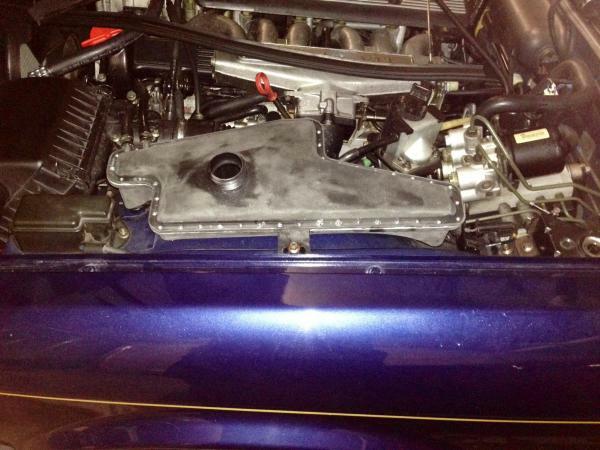 The coolant tank in my XJ12 burst it's seams recently and delivered most of the coolant over the side of the engine. I had the car towed home and removed the tank. I checked availability and price of a new tank with the local dealership in Brisbane and was advised that there would be a considerable wait and the price would be around $500! I ordered a new one on on line for around $260 and was prepared to wait. While waiting I thought that maybe I could open the tank where it had burst, it actually split the seam between the top and bottom parts, and force some sealant in the gap and then re-use my broken tank. I started to lever the tank gap with a large screwdriver and as the gap widened the two parts of the tank separated even further so I thought maybe I can get the top off the tank and re-seal it completely. I continued to lever the two parts until I had them completely separated and it really didn't take a lot of effort. I originally thought that the two parts of the tank were plastic welded but infact the two parts were joined with an adhesive sealant. I cleaned all the old sealant off both parts of the tank and then got online to search for a suitable adhesive/sealant and JB Weld come up with the goods as far as temperature and strength were concerned. A local supplier had some. I also thought that to make the repair even more secure I would use small machine screws and nuts to hold the whole lot together. The local hardware had what I wanted. On the top part of the tank I measured the perimeter and decided on a bolt spacing of 25mm which needed 45 screws. I clamped the two tank parts together and drilled the holes around the edge of the tank. I then mixed up the JB Weld and completely filled the groove in the tank bottom with it and then clamped the two parts together while I inserted all the screws and nuts. There was an incredible mess of JB Weld all over the place which took some considerable effort to clean up. I left the tank for 24 hours to cure and then installed it back into my car. So far I have done over 500 kms with my repaired tank with not a drop of coolant has leaked and there have been no other problems. My new tank arrived a day after I finished my repair so it will keep as a spare if ever needed. When I figure out how to post some pix I will. The tank has split along the edge from the bleed pipes back. The opened up tank showing level float sensor, various pipe connections and interior construction. The tank holds about 1 litre to the minimum level and another 600 ml to the full level. The repaired tank refitted to my car. Last edited by watto700; 11-03-2013 at 03:44 PM. Very enterprising. If the repair was going to fail, I'd expect it to do so in the first few km's so it looks like you've got a permanent solution. On the underside of the tank is the alphanumeric >PA66-GF30< which I thought to be a part number. The Jaguar P/N for the tank is MNA4400AD. I Googled the alphnumeric and it turns out it is a designator for the type of material that the tank is made from. 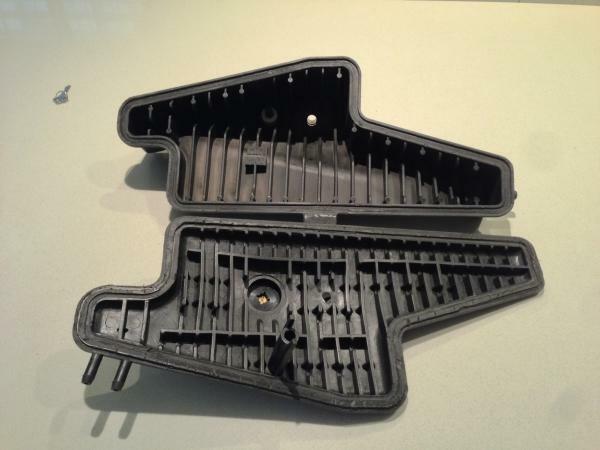 PA66 means it is a polyamide6,6 or a nylon and the GF30 means that it is reinforced with 30% glass fibre. So a glass fibre reinforced nylon polyamide. So a glass fibre reinforced nylon polyamide. Sounds high-tech strong! The problem is the tank is not one piece! I'm now considering adding reinforcing screws around the seams before I have a problem. The summer heat in Arizona is intense, as I suppose it is in Oz. Thank you for posting up with a great low-cost recycle/repair job. That looks good! Nice work!!! In the process of getting my V12 X305 back on the road after the harmonic damper needed replacement I removed both thermostats and temp checked them in hot water. As the water got hotter one of the thermostats opened at the correct temperature and the other lagged behind quite a lot which had caused that side of the engine to become hotter than the other side. This then caused a system over pressure and is why the coolant tank burst. The coolant temperature sensor is on the side of the engine that had the good thermostat so so the coolant temperature indication was normal. Cheers Jeff, thank you for that. I never did add reinforcing screws to the reservoir back then, and I subsequently never had a problem either. I can see the danger in having the coolant temp sensor on one bank only. Back in 2011 or so I put in new genuine thermostats, about 20k miles ago. I recently received a birthday gift from my son, an infrared temperature gun, which I've been meaning to use to check for this sort of problem. I will use it to check the temps on the new oil cooler hoses too. What a great gift! Interesting that the coolant tank burst as the weakest point in the system, given all the places a leak or burst could have happened. Sometime I will have to ask for details about the harmonic balancer rebuild. But all's well for now. Knock on polished burl walnut. 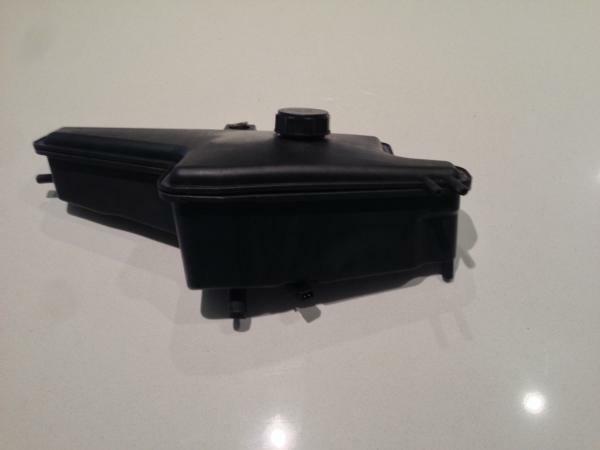 This seems to be a not uncommon problem with this type of two-piece tank, for example the Saab 9-3 series from the 2000s seem to all have their tanks leak at the seams at some point, even aftermarket replacements. For the Saabs, the only real fix is an expensive aluminum tank. I doubt there is anything like that for the Jaguar tanks though. I recently split one and I figured it could be put back together when I saw how it failed. Thanks for the information as I spect I will have more failures in upcoming years. 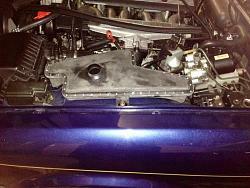 01 XKR head gasket DIY help!! Part # Radiator Flaps And Other, 6.0 V12.